The Bharatiya Janata Party’s MP candidate, Kirron Kher’s poll- campaign took a big leap after the Bollywood superstar Anil Kapoor along with Anupam Kher and the party cadre took to the city roads and addressed public meetings in her support today.Around three in the afternoon, Anil Kapoor, Kirron Kher, Anupam Kher along with BJP’s State President, Sanjay Tandon, General Secretary Chandershekhar and Councilor, Saurabh Joshi reached at BJP office in sector 37 to address the media persons.While talking to the media persons, Sanjay Tandon informed, “I have been receiving phone calls from many party workers of Congress, BSP and AAP since morning. They want to join the BJP. Our poll-campaign has gained momentum with the arrival of Anil Kapoor and we saw participation massive crowd while canvassing with him”. Adding to it, Kirron Kher said, “While canvassing with him today, I was reminded of his film ‘Nayak’ when he becomes a CM for day. When we were canvassing in Grain Market of Sector 26, I felt as if it was a rally for celebrating the victory instead of a poll-rally”. While speaking on the occasion, Anupam Kher said, “I am thankful to Anil Kapoor for his support. As far as I am concerned, I had joined Anna Hazare’s campaign against corruption around two years ago. As a citizen of India I had felt my responsibility to fight against corruption. I am here to support my wife in her movement to bring change. As an inpidual, Kirron Kher is a strong woman and is capable of voicing the issues being faced by the common man”. 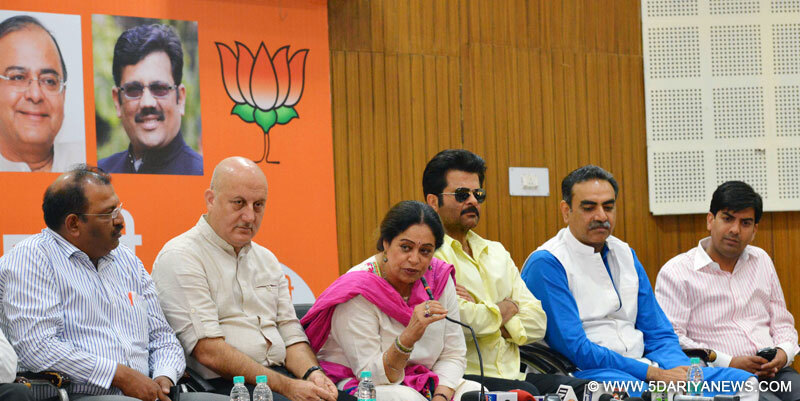 Highlighting the straight forwardness of Kirron Kher, Anil said, “Kirron will be a class apart from other politicians who don’t keep their words. I am also feeling little bit sad over the fact that she would leave Mumbai and would stay in Chandigarh to serve the people”. Being asked on joining the politics, Anil said that he was not cut out to be a politician but he has been inspired with Atal Bihari Vajpayee’s speeches. Answering a media-query, Kirron Kher said, “Though I can call many bollywood stars for campaigning but I want to fight in development agenda. I want to keep out the glamour quotient from campaigning”.Commenting on Aam Aadmi Party, She said, “The founder of the AAP does not care about the feelings of Kashmiris and is advocating plebiscite so that it can be a part of Pakistan. I don’t expect anything from such a party. Hundreds of our soldiers and officers of Indian Army have sacrificed their lives for the Kashmir, I am surprised that how could a daughter of an army man could represent this party”.